The 4th of July is one of my favorite holidays because you get to eat delicious food, hang out with friends and top it all off with an awesome fireworks show. Who doesn’t love that? As a kid the 4th of July always ended with us piling pillows and blankets in the back of my mom’s minivan. We’d park at the nearby lake and sit in the back of the car admiring the fireworks, while packing our cheeks with sugary treats. 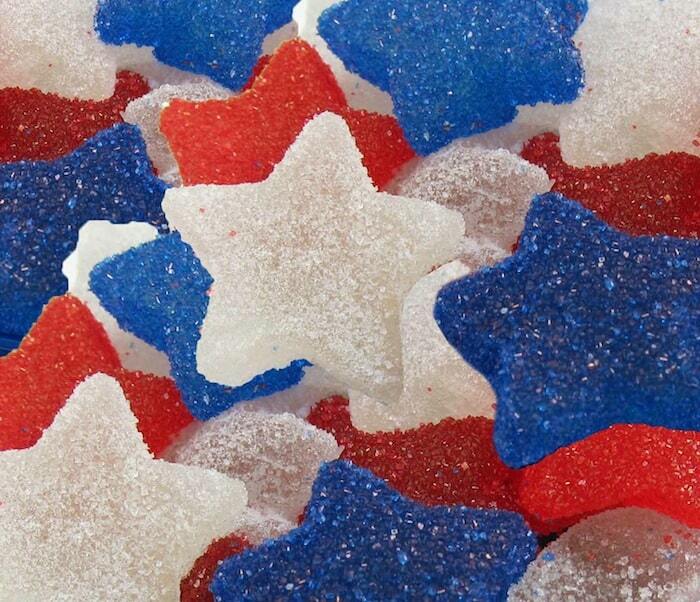 When I stumbled upon Beth’s Star Spangled Gumdrops from Hungry Happenings they immediately took me back to those days. They look so good I just want to pluck them out of my computer screen. 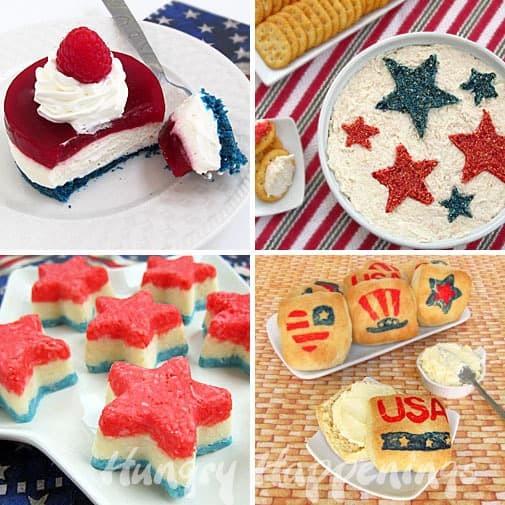 Her Patriotic Red, White and Blue Fudge and Ka-Boom Kakes are genius ideas as well. Have you ever made gumdrops at home? I hadn’t until just recently, and I can’t believe I waited so long. For holidays and special occasions I love to create edible crafts, or what I like to call themed cuisine, and I am particularly passionate about making festive sweet treats. When I spotted some star shaped silicone ice cube trays while shopping at Target, I new they’d be the perfect molds to use for my first attempt at homemade gumdrops. Making these confections was easier than I imagined. My first batch turned out perfectly. I found that these homemade sweets are softer than the store bought variety and aren’t quite as sticky. Once you crunch through the sugary exterior, the candy kind of melts in your mouth. They are easy to flavor using oils or extracts. I chose to flavor my entire batch green apple because I’d never had a green apple gumdrop and they didn’t disappoint. You can keep your candy clear and roll them in colored sugar, as I did, or you can add color to your candy and roll them in plain white granulated sugar. Either way, they’ll look sparkly and colorful. 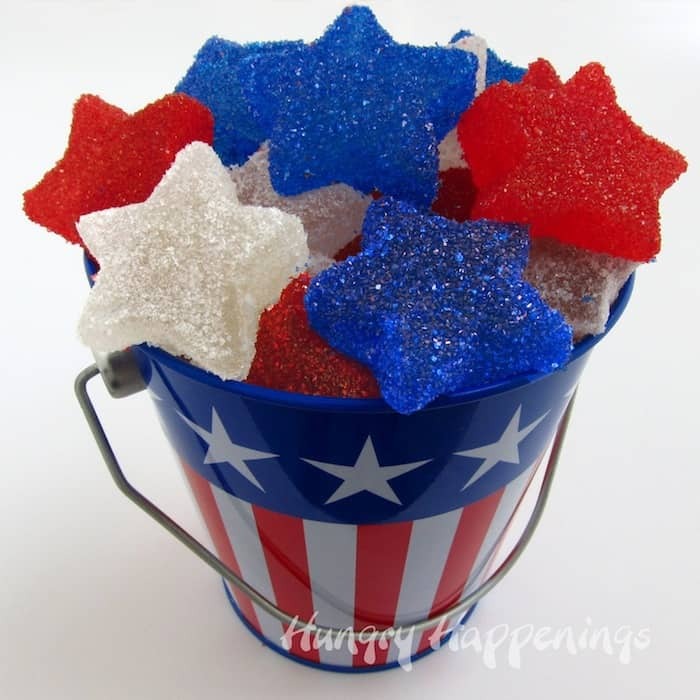 I piled my star shaped gumdrops into these little patriotic pails, which I also purchased and Target, and plan to serve them for the 4th of July, that is if I don’t eat them all before then. Oh, well, if I do, I’ll just make more. 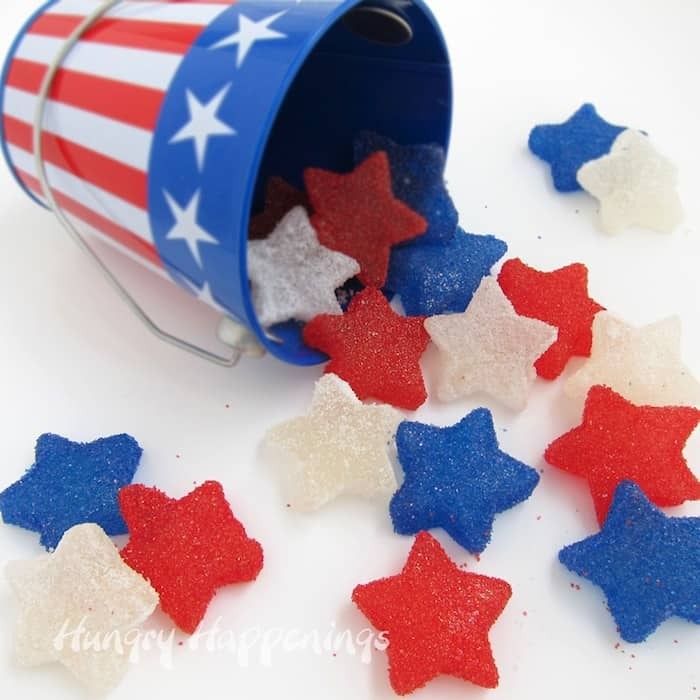 *I only had two star shaped ice cube trays, so I used another larger mold to make some other shapes, but I know you’ll need at least 4 of the star molds, maybe 5. I also saw the same ice cube trays at the Dollar Tree. Brush vegetable oil all over the cavities of your silicone mold. I found it easiest to put on a food handling glove, dip my finger in some oil, and rub it into the star cavities. You could also use butter, and I think I’ll try that next time. In the buttered saucepan pour corn syrup into the bottom. Sprinkle sugar in the center of the pan. Turn heat on medium-high and allow it to cook for one minute. Then stir gently to dissolve sugar. Be careful not to splash the sugar crystals onto the side of your saucepan. Bring to a boil, stirring constantly. This took me just a few minutes, but the recipe says it can take up to 10 minutes. Clip your candy thermometer onto the side of your pot. Cook until the thermometer registers 260 degrees Fahrenheit. You will continue to cook your sugar (ultimately you’ll want it to reach 280 degrees which is the soft crack stage,) but at this point, you need to set your pan of pectin mixture back on the stove and heat it over high heat until it comes to a boil. To flavor your gumdrops, add some flavored oil or extract, 1/4-1/2 teaspoon, if flavoring the whole batch. To check if you like the flavor, fill a glass with ice water, take a small spoonful of your hot gumdrop mixture and set the spoon in the ice water. Let it set for at least 30 seconds. Remove it and touch it to make sure it is cool. Return to water, if too hot. Taste it. Adjust your flavoring accordingly. Optional: You can divided your batch and use various flavorings, if you prefer. You can also add coloring now if you’d like. Grocery store variety food coloring will work fine. I left mine clear and used colored sugars and was very happy with the result. Carefully pour into the silicone mold, filling each cavity to the top. Let sit at room temperature for at least 8 hours for best results. I pulled a few stars out after just a few hours, and they looked like stars, but flattened out a bit. Those left in the mold overnight, looked perfect when removed the next morning. You can see the blue star second from the right below was pulled out too soon. To remove your gumdrops from the silicone molds, press firmly all around one of the stars then peel the candy out of the mold. Coat it in colored sanding sugar or granulated sugar. Let them sit at room temperature for about an hour before packaging. 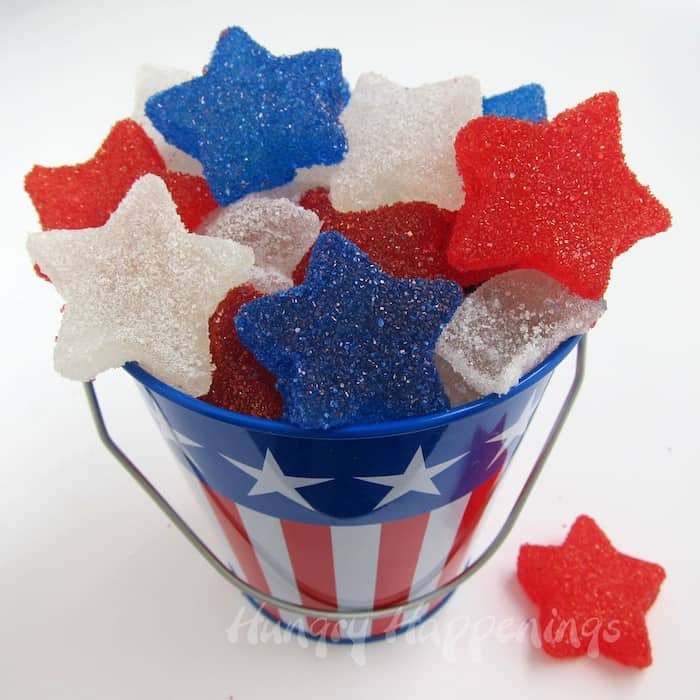 Package in festive Fourth of July pails, boxes or bags or simply set them in a candy dish and enjoy. Products used to make this recipe that are available on Amazon.com. 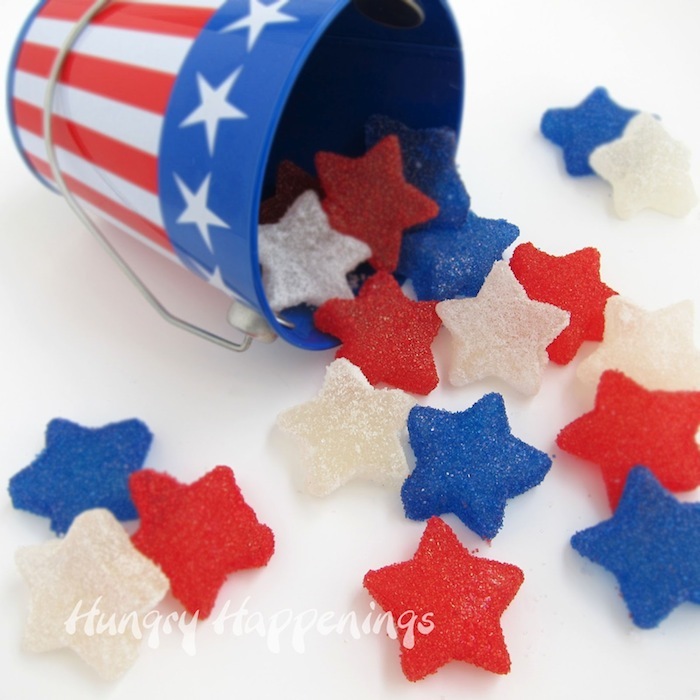 Be sure to check out these other Hungry Happenings’recipes that would also be great for Fourth of July. These look so yummy and they are definately festive! How clever. And I’m thinking now of all those ice cube trays with the fun shapes and the lovely gumdrops I could make. They look great! I’m pretty sure kids will gladly like them. It might be a bonding time for parents and kids to do such gumdrops. Oh by the way, thank you for sharing.